Based on above findings aircraft was operated on June 23, 1996. Aircraft crashed during flight killing all aboard. These more thorough inspections were not performed presumably because In Service Condition Inspections were all that were required (in the opinion of some airplane owners and mechanics) to determine the safety of the engine. Unfortunately, In Service Condition Inspections were not adequate given the age of the engine. "Bad practices that result in no immediate ill effects wind up becoming the norm." 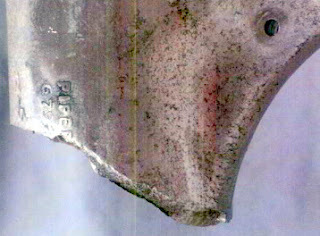 Fractured landing gear leg from Stress Corrosion Cracking. Doesn't have to look bad to be bad. A post-mortem examination found evidence of soot in the airway of the pilot, which indicated that he had been breathing during exposure to smoke. Toxicology results showed the presence of cyanide in the pilot’s blood at a significantly elevated level; cyanide is a common combustion product of some materials found in aircraft construction. Propeller Loss "Had the failed engine been overhauled within the manufacturer’s recommended time of 2000 hours, or even within 2200 hours had it met the manufacturer’s 200-hour extension requirements, the overhaul would have occurred before the flange cracking had reached a critical stage and the crankshaft should have been scrapped." The occupants were fatally injured. "A fatigue crack developed in the engine crankshaft as a result of corrosion pitting and the absence of a case-hardened layer on the fillet radius of the number six connecting rod journal. The fatigue failure of this section of the engine crankshaft resulted in a complete loss of power." Both occupants were fatally injured. The helicopter was completely destroyed in the post-impact fire. Enstrom F-28C Helicopter C-GVQQ total time in service of 611 hours over the 27 years since the 1982 overhaul. "The fracture of the check ball retainer in the exhaust valve hydraulic tappet..."
"Old designs are never proven for fatigue simply by virture of their longevity. Fatigue is wear-out. There is no guarantee that future failures will be confined to those seen in the past." Steve Swift,GNATS AND CAMELS - 30 Years of Regulating Structural Fatigue in Light Aircraft"
Crankshaft Fatigue Failure in TIO-540 Engines operating past TBO "The inspection method to detect crankshaft fatigue cracks is conducted using a magnetic particle inspection (MPI), and the opportune time is at engine overhaul"
Interesting accident in that the 100 hour inspection did not detect worn spark plugs, broken piston rings, and burnt piston. Obviously, not all inspections are done to proper standards; unfortunately, for the flight instructor and student they had had no way of knowing. However, if the instructor had followed Lycoming's recommendations as to TBO time, the accident would not have happened. 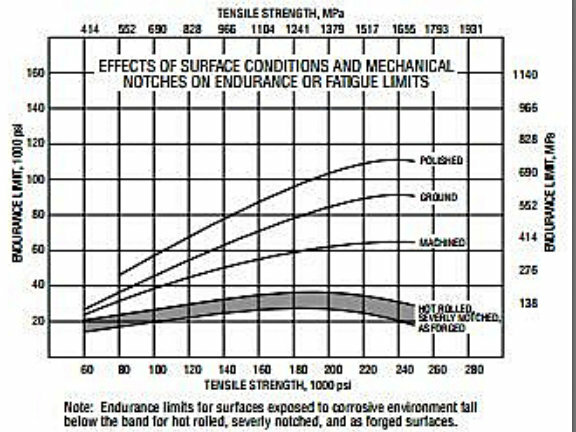 The chart below is from Timkin Practical Data for Metallurgist.and shows endurance (fatigue) strength for various surface conditions. 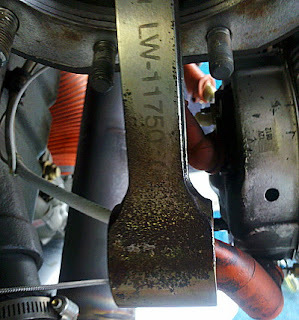 If we use the polished Lycoming connecting rod in the picture above and assume that the strength is 120 psi for a polished surface. With corrosion pitting the endurance strength drops from 70 psi to below 20 psi. Read the note at the bottom! What is "endurance strength". Typically, when we think about strength it is how much force is required to fail the part -- either break or bend. This is important for our connecting rod material must be strong enough to resist the loads. However, our connecting rod is subjected to repeated loads. Given enough of these repeated loads the rod can fail at a very different stress level than a one-time applied load. This is the endurance strength. Obvously then, we should be very concerned about endurance strength as our rod is subjected to many, many repeated loads.However, a bolt for example might only be subjected to the initial load when it is tightened so in this example, endurance strength is not an issue. Does your engine need an overhaul? 1. Yes, based on the manufacturer's recommendation. 2. Is your engine in need of an overhaul based on its condition? How would I know? I know of no accurate method of answering question #2 based on "other parameters". I have given a lot of thought on this over the years -- You see I am an internal engine guy who spent time inspecting the insides of engines. Most mechanics are outside guys who inspect the outsides of engines. It always amazed me how we would find serious internal problems in engines that the outside guys never knew existed. Flat camshaft lobes, bent pushrods -- how did the engine fly? -- "smooth as silk, hated to overhaul it". "Your camshaft is junk" --but It just want through a "pre-purchase inspection!" Based on my experience, how can I trust the "outside guys" to get it right? Pendulum Detuning is another concern I have about internal engine wear. My personal opinion, I have never owned, flown, or will fly in an aircraft who's engine is past manufacturer recommended tbo. But then again I am old fashioned. Hours and calendar time are by their nature arbitrary and can be wasteful. Kind of like "replace hoses every 5 years". My nature is to rebel against such absolute statements. Another absolute is to tear down an engine after any propeller strike. In many cases all of these can lead to an expense that might not be necessary, if we had adequate knowledge before. But we don't so we inspect. Its not a process of guessing or opinionizing; either we have adequate information or we go get it through an inspection process. My background is: "I will inspect and then report on the condition. That is what an engine shop does. The decision to take the engine to the shop in the first place is made by someone else. I was never in that business of guessing on what the condition might be. I'm therefore biased toward doing the inspection. For many years we did about 12 propeller strike tear-downs a year. Boy, I thought, if I could come up with a way of inspecting for damage without tearing down the engine I would be a rich man. I couldn't and I don't think anyone else can -- for prop strike inspections. I knew that "statistically" many engines were OK -- but I never knew which ones those were -- Mechanics deal with individual aircraft airworthiness -- statistics deals with a population of aircraft. I therefore cannot condone the use of statistics as a reason to determine airworthiness on individual aircraft. Now can someone come up with a comprehensive method of inspecting the engine for calendar time deterioration. I think it can be done -- but no one is doing it- at least at the level that I believe is necessary. The engine inspections done today are not comprehensive enough to adequately address some of the issues that arise when engines are in operation over a long period of time. standards of all large aircraft and given a fancy name "Damage Tolerance Analysis (DTA). If failure can occur without a detectable defect then some other form of intervention (life-limit) must be applied. In summary, if failure can occur in the absence of a detectable defect, the application of DTA is invalid. in sudden engine loss of power. This listing is not complete but used as examples of possible items. The experience of others would likely add to this listing and that is part of the problem. Not all catastrophic failure modes are known. DTA must include all possible failure modes that would result in rapid loss of engine power as being detectable. The detectable defect must also rest benign until the next inspection interval -- a unrealistic assumption for several types of defects). The only way calendar life limits will be obeyed in part 91 operations is by airworthiness directive. Most of my customers fly less than 50 hours a year. Statistically, engines are least reliable (as far as in flight failures are concerned) when new or newly overhauled. Reliability increases in mid-life and does not trend upwards significantly when approaching overhaul, or even beyond the recommended overhaul. However, there is little data when going many hours beyond overhaul, as most operators eventually replace an old engine for various reasons, which might include low compression, high oil consumption, low oil pressure and other tell-tale signs of wear. Don't confuse statistical reliability and wear. With that in mind, part 91 operators are never going to replace a perfectly good engine. And, I'm not at all sure it should be required. Statistically, there is a much lower chance of an in flight problem with a 2200 hour engine than there is with a 20 hour engine. Statistically, what you are describing is called the "bathtub curve". Here is a link to a good article on the subject. The argument that engines should be major overhauled every 12 years is absurd. Nearly every failure cited in this blog post is a fatigue or corrosion-related failure of cylinders, not a failure of the engine bottom end. It is absurd to suggest that engines need to be torn down to prevent cylinder failures, because cylinders are bolt-on accessories. What makes this really absurd is that the overhaul manual does not require cylinders to be replaced at major overhaul; they can (and often are) reused. In my opinion, the only component on a piston aircraft engine that really warrants a life limit are the cylinder assemblies, but they are the components that have no life limit under the current TBO system. The engine can be religiously overhauled in accordance with the manufacturer's overhaul manual and yet the cylinders remain in service indefinitely, with no regard to the finite fatigue life of the cylinder head casting and the head-to-barrel junction. I believe the concept of piston aircraft engine TBOs is fallacious and thoroughly discredited by the accident data (which makes it clear that the overwhelming majority of engine-failure accidents occur when the engine is young, not when it's old). TBOs as now defined should be eliminated altogether. Life limits should be established for cylinder assemblies, and regulations should be changed to require tracking of the time-in-service of cylinder head castings (something that is not tracked now). Anecdotal blog posts like this one are not particularly helpful. The NTSB accident data tells a very different story. "The argument that engines should be major overhauled every 12 years is absurd." I didn't make that argument. Nor did I express any opinion one way or another. 1. In Service Condition Inspections were not adequate given the age of the engine. 2. Accidents, and other age-related-failures not present in NTSB statistics, that could have been prevented by using more thorough Overhaul Condition Inspections that better inspect for corrosion pitting, fatigue cracks, and other deterioration both external and internal. I leave it up to others to form their own opinion. 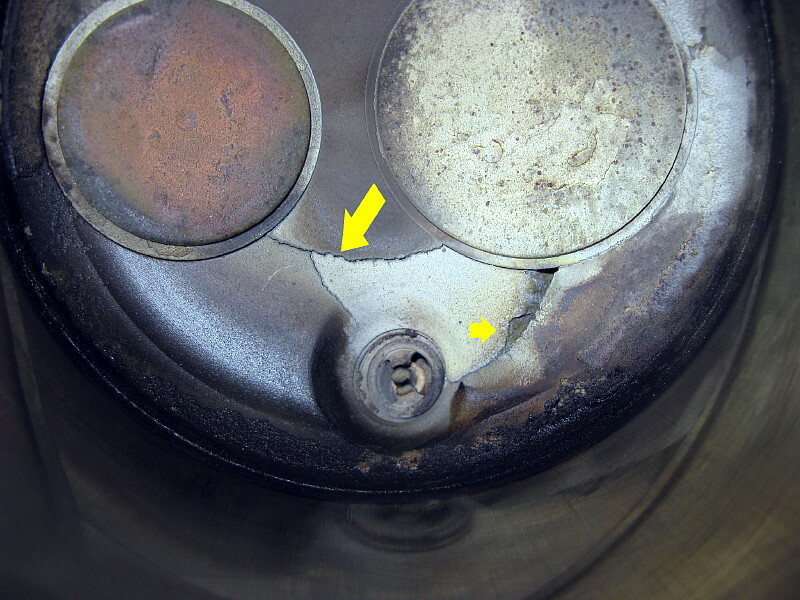 "Nearly every failure cited in this blog post is a fatigue or corrosion-related failure of cylinders, not a failure of the engine bottom end"
Really? 8 bottom-end examples - 2 cylinder examples by my count. "Obviously, not all inspections are done to proper standards; unfortunately, for the flight instructor and student they had had no way of knowing. However, if the instructor had followed Lycoming's recommendations as to TBO time, the accident would not have happened." Nor would it have happened if the CFI slept through his alarm and missed the lesson. To cite incompetent maintenance as a justification for calendar-time TBO makes no sense. Manufacturers set calendar-time TBOs for one reason: concern about corrosion on aircraft that fly few hours and therefore might go for many decades before reaching time-in-service TBO. That concern is a legitimate one. What is NOT legitimate is for the calendar-time TBO to be treated as a one-size-fits-all number. It makes no sense for the calendar-time TBO to be the same for an aircraft tied down outdoors in Miami and for one kept in a heated hangar in Denver or Tucson. Or for an aircraft that flies every week and one that is dormant four months out of the year. Manufacturer-recommended calendar-time TBOs are too simplistic, and overly conservative for any but the worst-case aircraft. There are many factors that affect the useful life of an engine or propeller. It's unfortunate that the manufacturers ignore all but two of those factors (calendar time and time-in-service). Internal engine corrosion might be more related to blow-by of combustion gas past the piston rings then to where the aircraft is parked. This might better explain why some engines corrode badly and others don't when operated from the same airport. Very detailed post on corrosion inspection for aircraft engines! Right now, I just rent 172's and put around with them. Not much to those engines! I'm always fascinated with jumbo jet turbine engines though. I got to get up close with new 777 engines, that was cool!